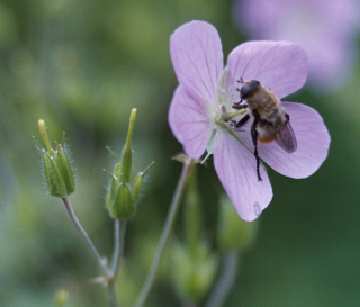 A bee visits a wild geranium blossom next to two green beak-like seedpods that are already developing. Westborough's pink lady's-slippers always catch our attention in the last week of May and the first week of June, but the same two weeks bring another rewarding sight—our native wild geraniums. The lilac-colored wild geraniums (Geranium maculatum) bloom along partly shaded roadsides and trailsides, especially in damp areas. The delicate-looking 1-inch blossoms are relatively large compared to most woodland wildflowers, which tend to be inconspicuous. The plants grow 1 to 2 feet high and have deeply cut, five-part leaves that are easy to recognize throughout the growing season. Wild geraniums are not related to the plants we commonly know as "geraniums" and buy for gardens, hanging pots, and flower boxes. These favorites are pelargoniums, originally imported from South Africa. Look for wild geraniums at the Headwaters Conservation Area along the trail from Andrews Street to Osprey Point (where you can see great blue herons and a pair of osprey in the nests offshore). The stretch of trail just before you reach the vernal pool is usually a good place to find the flowers. The wild geranium's blue pollen gives a blue-purple look to the ring of anthers around the plant's center. Another promising location is the Charm Bracelet trail in the Orchard Hill area, especially the trail from Gilmore Farm Road out to Gilmore Pond. Wild geraniums also grow in secluded places at the Bowman Street Conservation Area around Sandra Pond. Wooded roadsides are also a good bet. When you find wild geraniums, try taking a close look at the blossoms. Their pollen is blue, rather than yellow or orange as in most plants. Look for it in the anthers, the pollen-bearing male parts on top of slender stalks growing from the center of the flowers. If some of the blossoms are past, you'll also see green seedpods developing as the flower petals wilt and fall off. Over time the seedpods become longer and more beak-like. Their long, slender, curved shape gives the plant another name, cranesbill, because they resemble a crane's bill. Eventually the pods become dry and brown, and when the seeds are ripe, they pop open and fling the seeds into the surroundings, up to 30 feet away. But the small seeds' travels don't end there. Each seed has a "tail" that actually pushes it along the ground. The tail alternately curls as it dries out and then straightens as it absorbs moisture, moving the seed along as the process repeats. When a seed finally gets stuck or digs itself into the ground a little, it's planted. Like so many native plants, wild geranium has a long history of medicinal use going back to the Native Americans. The tannin in its leaves and roots made it useful as an astringent and in stopping bleeding. Sweetened with grape juice or milk and sugar, it served as a medicinal mouthwash or a gargle for children. Wild geranium was also used for sore throats, toothaches, gum disease, mouth sores, diarrhea, and venereal disease. 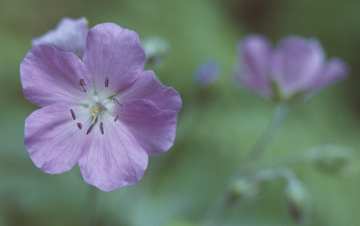 For people interested in gardening with native plants, wild geranium can be a good choice for partly shady, moist areas. The plants tend to grow in clumps but don't spread quickly, so they won't take over.